HIAS, the oldest refugee protection and resettlement organization in the world, is leading the Jewish community’s movement to support refugees, and we need your help. Now, more than ever, it is critical that we speak out on behalf of refugees and demand that our government ensure that the world’s most vulnerable people have a safe place to call home. STAY INFORMED on the latest developments in the global refugee crisis by receiving HIAS’ email updates. Sign-up now. TAKE ACTION Write to your member of congress. In the coming weeks, our government will determine the maximum number of refugees allowed to come to this country in the next year, and we need their help to make sure this number is at least 75,000. ATTEND AN EVENT Visit this page to find out when HIAS will be in your area. VOLUNTEER with refugees and asylum seekers in your own city. Visit this page for more information. 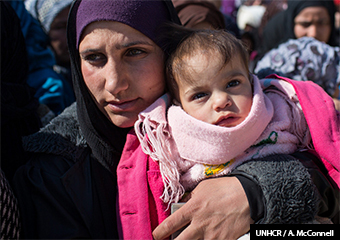 SPEAK OUT Call your elected officials to tell them that you support refugees and urge them to do the same. Click here for a script and instructions. INVOLVE YOUR COMMUNITY Ask your synagogue to join the more than 220 synagogues stepping up for refugees through HIAS’ Welcome Campaign. ACCESS RESOURCES about the refugee crisis on our Resource Page, including fact sheets and Jewish texts. DONATE to HIAS Your donations help us to assist refugees around the world. SHARE the information on this page with family, friends, and colleagues and connect to HIAS on Facebook, Twitter and Instagram. Finally, if you are new to HIAS, check out our 2 minute video to learn more about how our Jewish values and history call us to respond to the global refugee crisis. For 135 years, HIAS has helped refugees. We do not intend to stop now, but we need your help. Join us.